Near the start of the year, I opened up a Patreon as a means to create cool content for people that pledge for it. I still have a small number of patrons at the moment, but the contributions meant a lot and I made sure to get them involved in every reward in their respective tier. One that I had out for those that pledge $1 (the Wumpa Fruit tier) would be to get together and pick which of my daily sketches I should turn into a fully-colored image. Unfortunately, I didn't get any responses for August, so I instead decided to go for the sketch that got the most engagement over my Tumblr account. 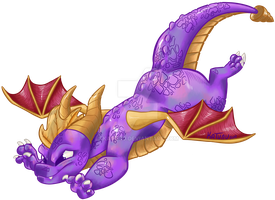 I was still riding the hype train for the Spyro Re-Ignited Trilogy at that point (and to be fair, I still am!) - and I find it so interesting that Toys For Bob decided to add a few little personal deviations with some character and scenery designs. 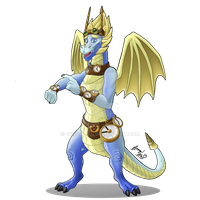 The dragons you save in the original game all have different accessories that suit the world hub they live in, and Nestor's final design was revealed a day before at a panel at the San Diego Comic Con. 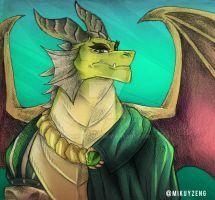 He's usually the first dragon you rescue because he's right in front of you when you start a new game, and the idea of a sculptor based get-up sent a lot of excitement to the fans at the time! It's natural that I'd sketch this big fella while riding the wave of excitement, though it gets hard when all I had for references was a concept art piece and footage of the panel shot at a bad angle. Obviously there were a lot more clearer resources when I started inking him, particularly sharpening any details around his face that seemed mis-interpreted and cutting back on the holes in his wings. He was a worthwhile challenge though - must've been a while since I last drew anything with scales! 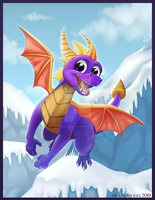 Spyro the Dragon is a game series currently secured by the grubby mits of Activision. I drew this! Welcome to the Dragon Realms. Very nice, good job. Nestor looks great.